How can sales training and networking go together? The essence of it is quite simple – good sales training can teach you to become a better networker, more effective and productive, which leads to increased sales at a lower cost per sale. Everyone in sales needs proper training. You might have the gift of the gab and think you can sell sand in the Sahara, but proper training can teach you how to utilise that talent and make you into a star. More than that, everyone in sales can benefit from periodic refresher courses. Bad habits creep in, and there are also new techniques developed that can make you into a better salesperson. First of all, it’s worth remembering that there are different types of sales training. The needs of someone in business to business sales are very different to those of a person in retail. The training can be tailored to the type of selling involved (there’s also telephone and business to customer, for instance), with courses lasting anywhere from one to five days – or, perhaps, on a CD or DVD to study at home. You can even have training in online classrooms and conferences. However, it’s all geared to the same end: to make more sales. Every sales person has targets, and meeting those can be hard at times. Training makes it easier to meet and exceed goals. It teaches ways to overcome objections, to understand the prospect, what they want and what motivates them, what questions to ask, the best way to organise time and how to build the most effective business relationships. That’s a lot to take in, especially if it’s a sales crew with differing levels of experience. But it can easily pay for itself in increased sales. If a booster course is given to staff on an annual basis, then your staff will be very productive. The best sales training isn’t a one-size-fits-all package, but one specially designed to meet the specific needs and demands of your company, with an understanding of your business - in other words, bespoke, as opposed to off the shelf. It should include plenty of support for sales staff after the course, for they’ll need it to be completely effective. One important aspect of sales training is an emphasis on networking. Quite simply, it’s more cost-effective and productive, both in terms of time and closing ratios, than cold calling. Training sales staff to take full advantage of all networking opportunities, and helping them learn how to create them, is a very important sales tool. 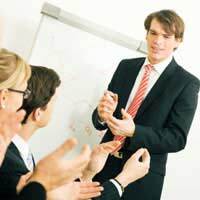 Good sales training will teach the techniques, ranging from how to ask for and use referrals, to create a word of mouth buzz about your product or service, all the way to teaching sales staff how to work a room at a meeting, or get the most out of business networks – or even create one of their own, if necessary. There are even sales courses that focus solely on networking and building relationships in business, covering everything from phrases to use to body language. It helps build communication styles that are most effective at producing results. Better networking can be taught. After all, none of us starts off knowing everything, do we?